Specialising in historically accurate handmade, bespoke reproduction frames from the 15th century to the present day. The Company is renowned for its attention to detail and authentic methods of building. View a small selection of our frames. If you are looking for something specific please contact us. A range of frames produced for important collections worldwide. Preview your painting in historically accurate frames using our pioneering computer imaging service. 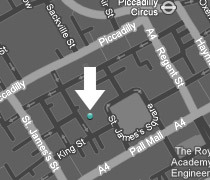 The showroom is conveniently located in the St. James’s area of central London, near Christie’s auction house. Our team of experienced craftsmen accurately recreate and restore antique frames using traditional methods and materials.